Today we went over to Emerson's house for a little outdoor fun. As you can see, she has a huge set up in her backyard w/ two pools, an elmo sprayer, swingset, playhouses, etc. It was 95 degrees today and we were so incredibly hot out there. Well, the moms were hot but the kids were fine! Sutton and Taylor had not seen Emerson since they got out of school over a month ago and they were so excited to see each other...it was cute. Also, Emerson has a big jumpy, bouncy thingy in her den (because it's so hot outside right now) so the girls had a blast jumping in that today also. They were exhausted when we got home and could barely stay awake during lunch. I finally did it....pigtails on my babies! I have wanted to put their hair in pigtails for a long time but just couldn't bring myself to do it. I would get one side up, look at their little faces and take it right back down because they just look too big with it up. 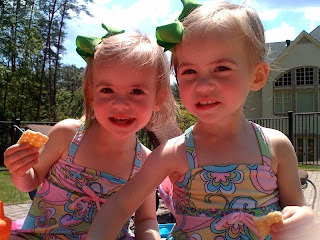 They both loved their hair and wanted to see themselves in the mirror and both said "cute!" when they saw it. These pics aren't that great because I took them w/ my cell phone. My camera battery was dead this morning. I bought myself a new beach chair several weeks ago and just used it for the first time two days ago. As you can see, the moment I got up both of the girls hijacked it and I couldn't get them out of it! They do have their own little chairs but they don't recline and they kept trying to figure out how to get theirs to go back after sitting in mine. I highly recommend this chair if you are looking for a new beach chair. You can carry it like a backpack, it has a "cooler" on the back, a cup holder, an adjustable pillow and reclines almost all the way back. Sam's $25. They still have them in stock in several colors. Boy is it hot! This morning we had our photo shoot for S & T's 2 year old pictures and we almost melted. The humidity must be really high today because I was sweating like crazy about 10 minutes into it. I think the photographer got some good shots but the girls were very cranky today. Sutton just woke up on the wrong side of the bed and was whiney all morning before we left and Taylor fell about 3 times during the photo shoot so she had her feelings hurt a lot of the time. We went to Aldridge Gardens for the pictures and it was the first time they had seen geese up close and personal and they LOVED them! We have a lot of geese in our neighborhood so they see them as we pass by in the car all of the time but not right up close and on foot. That's Taylor in the top picture being her usual wild and crazy self on the zebra and below being silly and not opening her eyes all the way for a picture. She walked around the house for about 10 minutes with those rings around her feet like they were shoes today...strange little child. This week we have been at vacation bible school at our church. The girls are not old enough to go unless I volunteer so....I, for some insane reason, volunteered to do crafts. If you know me well, you know how NOT crafty I am so it was a challenge. Let's just say I did the happy dance today at noon when it was all over! I was absolutely exhausted on Monday, Tuesday was better, Wednesday was another killer and today was fairly easy. The classes are scheduled ever 30 minutes and you only have 5 minutes in between to clean up and set up for the next class which is completely impossible. Monday we made prayer boxes out of popsicle sticks and glue...lots, and lots of glue. Kids don't know what "just use a little bit of glue" means apparently. I ended up w/ glue in my hair somehow! Tuesday we made little racoon thingies that were premade and just had to be glued together so that was easy. Wednesday we painted...yes, painted...with acrylic paint that does not come out of your clothes. The first class (2nd grade) made the biggest mess you have ever seen in all of your life. I was so stressed out trying to clean up and help them be creative all at the same time. We had sponge brushes which make a gigantic mess once you dip them in water to change paint colors and it just went everywhere. So, for the 2nd class (4th grade) I took the sponge brushes off of the table and hid them...just used regular brushes and it was much, much better. The first part was the background and today we painted either a cross, fish, or their handprint over it. A lot of them turned out really well and the kids all had a blast so it was worth it. Funny thing though...I had 2nd, 4th, 6th and kindergarten. Who do you think was the rowdiest, silliest, loudest, and wouldn't listen? The 6th graders. Who were sweet little angels and listened to everything I said? Kindergarten. I would have thought it would be the complete opposite! Live and learn. Tomorrow Taylor & Sutton are having their first professional pictures made and I am so excited! We are using Erin Nolen and we are going to Aldridge Gardens so keep your fingers crossed that it does not rain. I think it's supposed to so I guess we will have to reschedule if it does. I thought waiting until they were 2 would be best since they can follow directions better than at one but we'll see. Can you believe my babies are almost TWO??? I cannnot. Taylor & Sutton absolutely love their bubble machine! Bunny gave them little brooms about a year ago but they are just now big enough to use them. I don't think this is quite what she had in mind but they think it's fun. As you can see, someone always gets bopped in the head eventually. I put these cute little dresses on the girls yesterday and as soon as Sutton looked down at herself she said "Sassy" with her hand on her hip! They thought they were hot stuff in these. It is super hot today so what better to do than go for a swim? 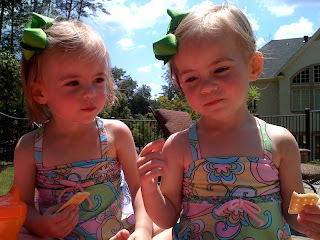 Brandi invited us over to swim w/ Vivi and Macy today and the girls had a great time. 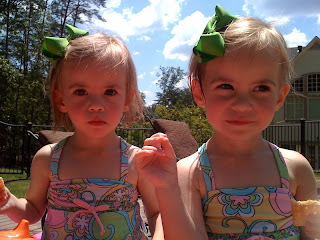 I was a little worried because the last time we swam was at their old house and the girls were not so sure about it. Today went great and we all had a blast. Clint bought them little crab floats that they sit in last year that we never used so we tried them out today and they worked great. Brandi's pool is perfect for little ones because there is a big area on one side that is very shallow and just comes up to the girls waists. So we hung out there for a few minutes to get them used to the water and then we put floaties on them and they both enjoyed jumping into the pool (while holding my hands of course) and splashing. They kicked back in their floats for a long time and enjoyed me pulling them around the pool. Zeus, Brandi's 85lb. lab, even swam with us today and Taylor and Sutton thought that was a hoot! We had a great time and are looking forward to swimming a lot this summer.